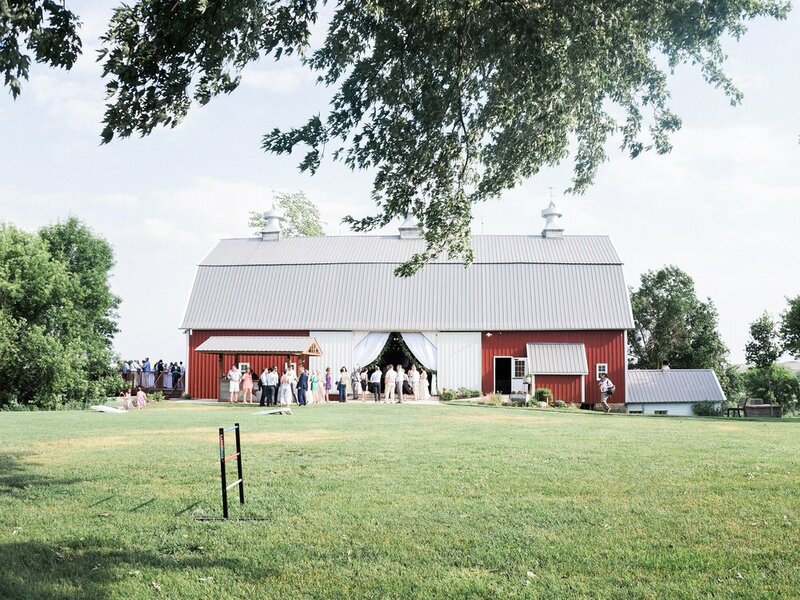 Barn venues are really becoming a hot commodity lately for the big day and we are not disappointed one bit! We love the rustic ambiance and the endless opportunities that each barn provides. Take a peek at these MAGICAL photos below that reveal the rustic charm of this barn and the beauty of the decor that brought this wedding vision to life! Do you feel like your wedding will be just like all the others at that same venue? Not to fear! I promise your vision is unique and so distinct to your personality that the same barn will feel like a whole new world. We have visited the same venues year after year and yet each wedding is so new and exciting! It gives us great joy to assist in making that vision that has been dreamt of for months, (or years even!) come to fruition. Below are 4 WAYS to turn the same old barn venue into your very own magical masterpiece! So no worries, you can take full advantage of your beauty rest, check another thing off your list, and KNOW that your venue will be spectacular and special to you and your family. There was extra garland left over so instead of wasting it, we put it to good use! We lined the curtains and placed it on tables to complete the greenery look and give the venue more texture and dimension. Color can change the aesthetic of an entire event. Choose a color that stands out to you and best represents your personality! The gold table runner added just enough color for a great contrast against the clean, crisp look of these white linens. Strung with care, these lights were complimented with a garland that changed the ordinary to extraordinary! Using the garland not only gave the ceiling another color, but it gave length to the barn giving it the illusion that it is more spacious, yet still romantic. Lastly, you want something that stands out upon first arrival. Whether that be a big sign, a picture, decor lining a walkway or something else! Make sure it represents you as a couple and I promise your guests are going to love it! The curtains to the entrance of this reception provided elegance and grace to the rustic charm, while still giving it the statement the barn needed. The vision that was dreamt of for days finally came to reality and was yet again another wonderful wedding that was like none other! Still a little hesitant on knowing your barn will be unique to you? Check out our previous post on 15 Ways to Dress a Farm Table for more inspiration! This recently opened farm venue north of the Twin Cities was the perfect place for a styled shoot. The day was spectacular, and the people involved were just as incredible. The atmosphere of this setting was a great space for trying out some new rustic ideas with a sweet, elegant undertone. Filled with greenery, lavender hues, and soft grey chiffon, the historic ambiance of the barn was complimented well. Check out some of our favorites shown below! We love complimenting a draped arch with other decorations like these hanging glass ball vases with fresh flowers! And to top it all off, the shoot even had a horse! This day was nothing short of greatness! From start to finish this bride was ready for her day, as most brides are. The rain tried to dampen the morning by making an appearance but did not keep this bride from walking down the aisle of her dreams. She made a quick change in ceremony sites, added some cafe lights and a chandelier, and had the comfiest, cozy ceremony, which was nothing short of greatness. With an umbrella in hand, and her dad at her side she was ready to walk through the curtains and down the aisle to the man she would soon call her husband! With the rain drizzling down behind them and the soft glow of the lighting, they had a ceremony that would be remembered forever! The simple chandelier that Elizabeth chose gave them such a great focal point and centerpiece for their first kiss as husband and wife! Simple white curtains only added to the comfy feel of their ceremony and provided a great backdrop for the couple at any time of their beautiful day! As the evening goes on and the party continues, the lighting only gets better! The cafe lights began to make their appearance and soften the evening even more with such a sweet, romantic glow. It's no secret that I love my job. I could fumble around with the words to explain just what makes my work so rewarding, but why try words when a single photo can explain it all! The look on the Bride's face when she sees that her dream has become a reality is everything to me. I was so lucky to work with Kristen on her wedding and overjoyed that her photographer captured the moment she walked into her reception and saw all her decor and design had come together just as she dreamed. Ok, now sappy stuff aside let's dive into the epic details of this ridiculously beautiful wedding! Want to make a statement? Try hanging SIX chandeliers over your head table, and voila, you have a head table set for royalty! Chandeliers were just the beginning, Kristen carried her classic contemporary look throughout her reception. The tables were draped with black and white stripe runners and decked out with gorgeous white floral a top gold risers and surrounded by glistening gold mercury glass. Kristen wanted to make a statement with her bar. We strung cafe lights 30ft down from the catwalks to create a backdrop for her bar. Pearls were a part of Kristen's design as well; they were scattered throughout the reception. Strands of pearls were swaged across the bride and groom's chairs and could be found dripping from the canopy of greenery centerpiece on the head table. This photo has nothing to do with decor, but it needed to be shared. Look at the love between Kristen and her wedding planner, Casey! Casey did an impeccable job pulling off Kristen's wedding. From the minute I met with Danielle, I knew she had put a lot of thought into her wedding decor. Danielle had a very specific vision for how she wanted to adorn the ballroom at her venue, the St.Paul Athletic Club. Danielle picked out decor pieces to create a totally custom reception that transcended the definition of classy. Her linens, a champagne satin, set the tone for the timeless look. Danilelle's must have was a touch of sparkle which she incorporated with a rhinestone sash buckle. The table tops glistened with mercury glass candlestick and mercury votives, mixed with white floral by Sadies Floral and just a pop of red. Danielle wanted her head table to stand out so we picked our stunning Aubrey Lace as an overlay to make the head table stand out. 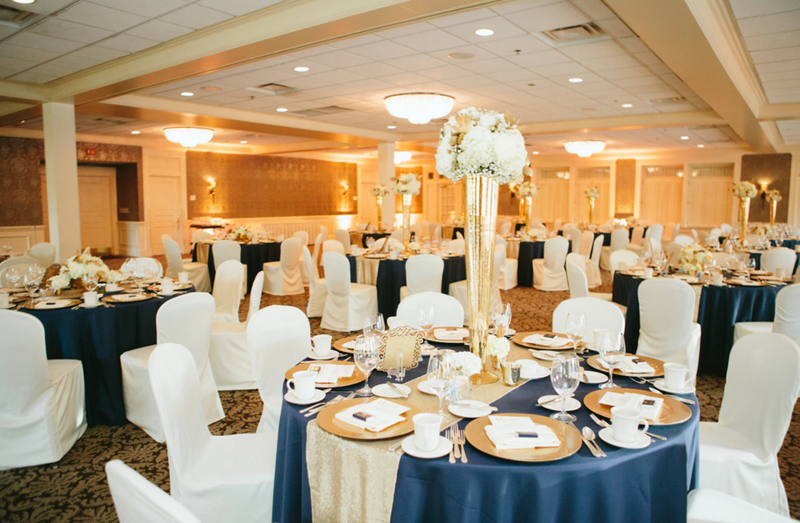 Fall in love with the glimmer of this navy and gold wedding. Jessica, the bride, was a joy to work with. Jessica had a vision for her wedding and she carried that vision out with a lot of planning and attention to details. We think all Jessica's hard work paid off as you can see in the photos! Jessica chose a harvest table for her head table seating. Harvest tables have been gaining in popularity over the last couple years and we are loving it! Get this look: Ice Chiavari Chairs, Ivory Rossette Chair Caps, Ivory Rosette Table Linens, Gold Chargers. Whether you are using a harvest table, a traditional head table, or a sweetheart table, it is always a good idea to make your head table stand out from your guest tables. You can make your head table stand out with something as simple as a specialitly linen. The guest tables had various centerpieces from tall to short, to create more depth in the room. Get this look: Ivory Chair Covers, Nay Polyester Table Linen, Gold Sequin Table Runner, Gold Chargers. Last summer we had the pleasure of being a part of this lovely wedding at the Landmark Center in St.Paul. The couple picked a classic look using silver and cream with a touch of blush. Get this look: Silver Satin Linens, White Chair Covers & Silver Satin Sashes. It's always a joy to be a part of a wedding at the beautiful Chankaska Creek Winery. For this wedding the couple picked a timeless color scheme with black and white. The wedding ceremony was held at the winery in front of a custom backdrop by We've Got It Covered. The reception was in the winery's onsite tent. We draped the reception tent with white and black fabric and hung a crystal chandelier over the head table. We also designed a custom head table backdrop based off of an inspiration photo the bride found on pinterest. The chargers, mirrors, and crystal centerpieces were provided by We've Got It Covered. "I will stop loving you, when an apple fruit grows on a mango tree, on the 30th day of February." Spring is in the air and we are swooning over this sunny, spring, apple blossom filled, styled shoot! Get this look: Pink Chiffon Chair Backs and Ruffles, Ice Chiavari Chair, Ivory Draping.